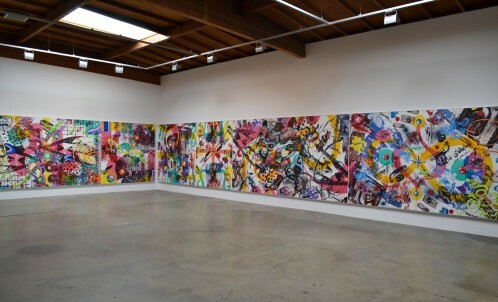 Honor Fraser currently presents Pop Renaissance, an installation of a selection of work from Kenny Scharf’s participation in the Pulcherrimae Strade initiative in 2001. For the project, created to showcase contemporary art in historical spaces, Scharf covered the ceiling of the Palazzo Communale in Pordenone, Italy with four 33 foot canvases stretched between the beams of the coffered ceiling. The images in the work were inspired by the iconography of Giovanni da Pordenone’s altarpieces and function as a reinterpretation of classic Renaissance paintings such as Bellini’s ‘The Seven Deadly Sins’. 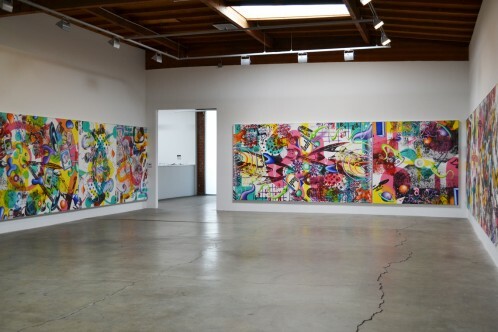 On occasion of his current exhibition, Kenny Scharf painted a mural nearby the gallery.